The author of these articles, Tim Rifat, is Europe’s foremost independent author and scientist specialising in psychotronics, the use of biophysical and electronic technology to influence and kill the human organism; his forthcoming book: Remote Viewing, gives hints of the breakthroughs he has made in the physics ofpsy-warfare. This was developed into a whole array of weapons systems based on the dramatic effects of pseudo-ELFs on mind controlling, elctro-chemically zombifying or inducing cancer in victims. ELF or pseudo-ELF was also found to be able to cut or damage DNA, which partially explains the carcinogenic effects of pulse or amplitude modulated microwave, UHF or RF. In Britain, microwave is defined as between 300 MHz to 300 GHz, or in USA terms above 1 GHz. Ross Adey’s research was done on 450 MHz carriers used to broadcast pseudo-ELFs via pulse or amplitude modulation, his colleagues carried out the same research at 147 MHz (these frequencies have been defined as UHF and VHF respectively in US terms). This research allows the weaponisation of any microwave, UHF or RF transmitter, if pseudo-ELF could be induced upon it by pulse or amplitude modulation at ELF frequency. The new science of RMCT spawned a new range of EM weapons to mind control and murder by use of pseudo-ELF. For a specific example, the new TETRA system which will be used by the police and emergency services in the UK for communication, uses between 380 and 400 MHz, which is switched on and off at such a pulse rate that a pseudo-ELF of 17.6 Hz (17.6 times per second) is produced. this means the brain and nervous system are hit by pulses of UHF (USA terms) microwave (UK terms) every 1/17.6th of a second. This is rather like electrochemical hammer blows to the head at a rate of 17.6 every second. Some of us find hammer drills irritating to listen to, imagine 17.6 hammer-like blows being delivered to the nervous and endocrinal system, at a cellular level – might this not have a disruptive effect on the organism? Since the cells communicate to each other in the ELF range, these hammer-like blows of pseudo-ELF disrupts and derange cellular activities, leading to dysfunction, behavioural changes and onset of carcinogenic proteins which can lead to the organism developing tumours. This system will be used by all UK police and emergency services by the end of the year, as the Home Office has sold off all police frequencies, so they are forced to use the new system. 30,000 transmitters will be placed around the country to maximise the effects on the local UK population – mass mind control. Anyone who has complained of these transmitters has received a letter from the Government informing them that if the transmitters are not positioned where the Government wishes, there can be no guarantee then of police protection, which will lead to higher insurance premiums for the householder. A leading UK newspaper tried to run this story, but had the item quashed by high-level Government intervention. Greek Cypriots have been rioting outside the British military base in Southern Cyprus, protesting against the destruction of 190 foot microwave towers, which are to be used by the British Army and NATO to broadcast high-power microwaves. A Greek MP was arrested by the police and the 1000+ Greek Cypriots stormed the jail and broke him out. 1. A massive build up of NATO forces in Cyprus in order to support Ariel Sharon’s forthcoming genocidal war against the Palestinians and to occupy the Lebanon as a so-called peace-keeping force after Israel has sterilised the area. This situation comes about because ultra-rich Jewish families own the West via the Federal Reserve and the Bank of England, and most of the multi-national companies that trade in the so-called free world. 2. The Turkish government has refused NATO carte blanche passage through its country and the Turkish military have refused NATO’s request that the Turkish armed forces come totally under their control if the need may arise. This dictates that there is no passage for NATO to support Israel unless they use Cyprus. Cyprus is a perfect situ for the NATO strategy of causing war between 2 belligerent parties and then taking over that country as a so-called peace keeping force; examples of this being Bosnia, Kosovo, Macedonia – where NATO arms, organises and co-ordinates both sides of the conflict – and the failed Chechen rebellion which was armed and co-ordinated by America and Britain. To stir up a war in Cyprus, the British are building these transmitters with an aim to mind controlling the Greek Cypriots into a state of mindless violence; the frequency for this being 11.3 Hz, amplitude or pulse modulated from the microwave transmitters. This frequency will cause the Cypriots in the South to feel uncontrollable anger and British and NATO hope will cause a far-ranging conflict in Cyprus so NATO can bomb the Turks into submission and take over the island as an English stepping-stone to aid Israel. This may seem far-fetched, but the British government is in the process of mind controlling the entire UK population using CIA research from the Pandora Project and the so-called TETRA system which costs £2.5 billion will place 30,000 transmitters in every urban conurbation in the UK. Further to this, the British Army has long experience of using microwaves for murder and mind control in Northern Ireland. In 1977, the CIA contacted Margaret Thatcher and gave her all the details, elf frequencies, to induce cancer, paranoia (4.5 Hz), depression (6.66 Hz), manic rage (11.3 Hz) — To support this assertion that the British Amy have been targeting Catholic areas with high-power microwaves, Dr Damien Burn – 38 years General Practitioner in the Falls Road, West Belfast – and Mary Allen, South Armagh Cross Maglen – have protested vehemently that British Army bases are broadcasting high-power microwaves, causing massive cancer deaths among the Catholics. The microwaving of peace protesters in Greenham Common, a US airbase in Britain, is common knowledge. The murder and mind control by the British Army of the entire Catholic community of Northern Ireland is not. Taking this into account with the TETRA system that seeks to turn British police and the public into zombies using microwave and elf, the deployment of microwave transmitters in Cyprus has a more covertly nasty raison d’etre than simply extending NATO’s communication network. The CIA-funded Dr Ross Adey to investigate the mind-controlling and hormonal-effecting uses of pulse and amplitude-modulated microwave and RF (radio frequencies). Ross Adey experimented with 450MHz, which in the UK system is microwave, as the British take 400MHz to 400GHz as microwave. His associate, Dr Blackmore, experimented with RF frequencies at around 150MHz. This was developed by the British Army, the Secret Police, into a variety of pulse-modulated, or amplitude modulated, radio frequency or microwave transmitters, which focussed on the target ELF which had bioactive effects to kill or mind control their targets. The amplitude or pulse modulation of the carrier wave allows the British Army/Secret Police (MI5) operatives to induce ELF frequencies on the victim, even though the carrier wave is in the RF or microwave range. The British Army are building an immensely expensive ultra-sophisticated version of HAARP, the US mind-control/weather-control weapon of mass destruction, in their large army base at Greek Cyprus. 200 metre antennae are being constructed, powered by megawatt power stations to fire pulse radio frequency at between 8 and 16 MHz. Apart from its use as over-the-horizon RADAR, the pulse modulation of the RF can be modulated at ELF frequency to mind control the surrounding countries. The British have stated it is targeted on Iran and Iraq and like the system in Norway, which can bounce RF off the ionosphere, the British version has the ability – like HAARP – to bounce its millions of Watts of 8MHz transmissions off the ionosphere to control the weather, destroy communication networks, and to violently upset whole populations by inducing ELF behavioural changes, neurological changes, and physical trauma. 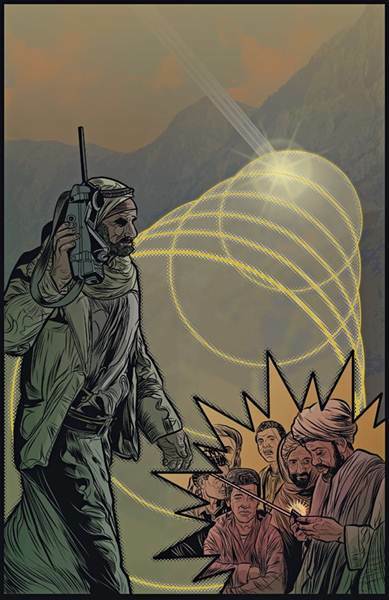 British computers can change the frequency to 16MHz, so it acts in its ionosphere back-scatter mode; this allows focussed beams of megawatt RF to be targeted on Baghdad, Tehran, Damascus…etc. In the 16MHz mode, the inhabitants of cities can literally be traumatised into submission, or so behaviourally disorganised that the city is made uninhabitable. As well as this capability, 16MHz beam can bounce off the troposphere – which is much lower than the ionosphere – causing atmospheric pressure inversions, which can literally knock aircraft out of the sky. Considering Southern Cyprus allows this British super-HAARP to attack Turkey, Russia, the Lebanon, Syria, Iran, Iraq, Afghanistan and other surrounding areas, its deployment by the British Army puts them on par with the Americans as a military superpower. Considering their track-record of microwave genocide in Northern Ireland, the use of CIA research by Dr Ross Adey, in the form of TETRA, to mind control British Police and the UK population, the targets of the British super-HAARP should not be surprised if murder and mind control are beamed down upon them with megawatt ferocity by the British Army. The Truth Campaign magazine will be running an extensive article on this subject, in a forthcoming edition. The fear centres on the operating frequency of 17.6Hz assigned to Tetra when the system was being established. This means that it emits radiation in pulses occurring 17.6 times a second, a level some scientists believe can penetrate deep into the brain, damaging cell communication. Roger Coghill, an independent research scientist and a member of the Department of Health’s UK mobile telecommunications health research programme, said: "A criminal could not have come up with a better system. They couldn’t have chosen a better frequency with which to disarm and debilitate the very forces that are trying to secure their arrest." Alasdair Philips, an expert on the biological effects of electromagnetic radiation and director of the campaign group Powerwatch, said Tetra had the potential to become the "next asbestos". "It is beyond belief that any one could be contemplating the rollout of a system like Tetra because of the evidence about the dangers of pulsed frequencies," he said. "To design a communications system based on these principles is mind numbing. The effects we may see could well be on a par with Gulf war syndrome." ERGENEKON DOSYASI : ESKİ EMNİYET İSTİHBARAT BAŞKANI BÜLENT ORAKOĞLU 2013’TE ERGENEKON İLE İLGİ Lİ NE DEMİŞTİ ? ?